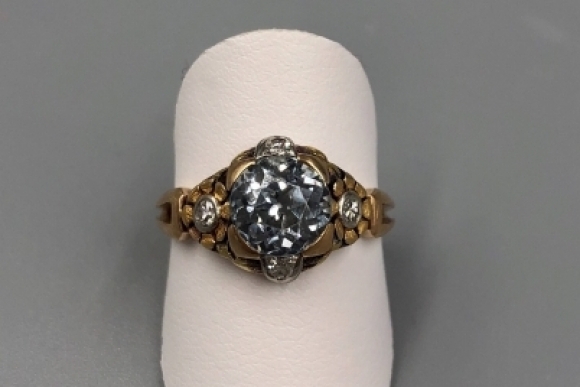 As rare and special as your love for her, this beautiful antique 14K and 18K yellow gold Montana sapphire and diamond ring is a rare piece of California Gold Rush jewelry. Set with an Old European cut natural blue sapphire measuring 7.5mm x 5.5mm for a calculated weight of 2.58 carats. 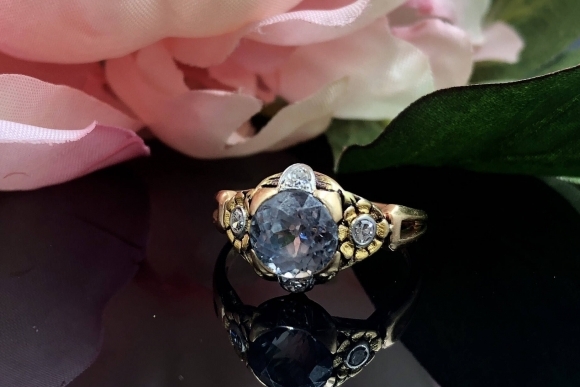 The sapphire is accented with four antique single cut diamonds, two of which are bezel set in 18K gold flowers. 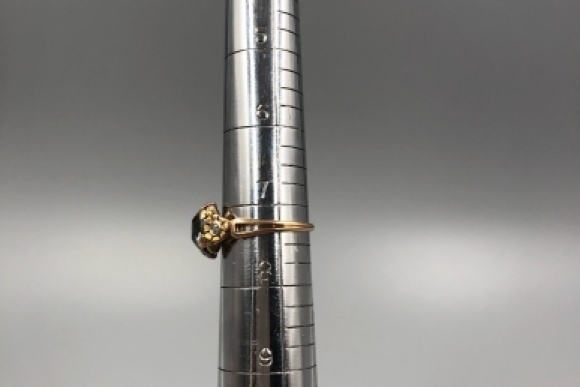 The diamonds range from 2mm (2) to 2.5mm (2) for an estimated total weight of .15 carat, and have a clarity range of VS1 - SI1. 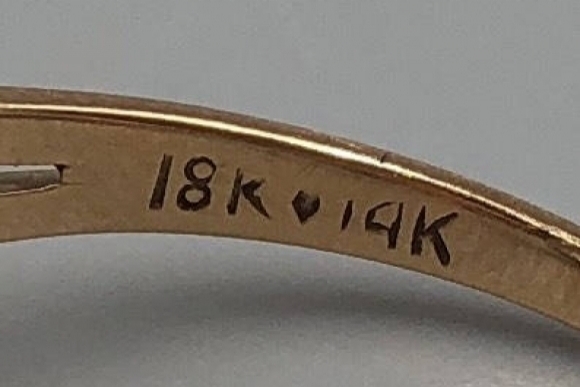 The ring is stamped 14K 18K California Gold. 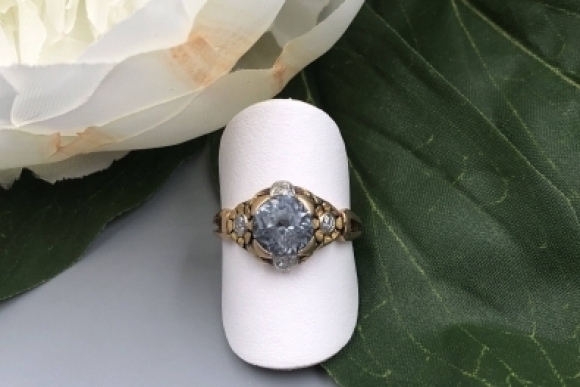 A one of kind antique beauty that is truly an heirloom of yesterday and tomorrow! 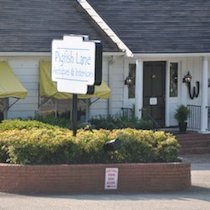 While short lived, the rush to strike it rich put California on the map, and in fact was critical to its admission to the Union as our 31st state. 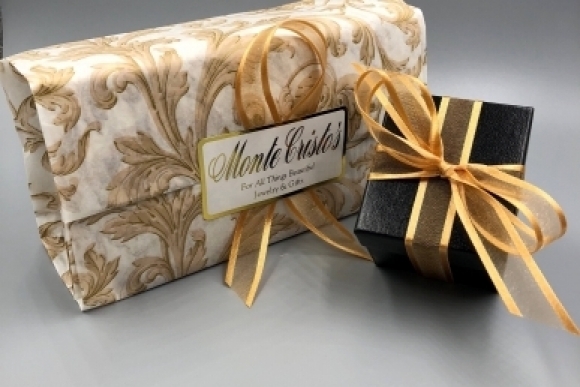 Gold discovered in 1948, by James Wilson Marshall in the American River at the foot of the Sierra Nevada mountains, sparked the California Gold Rush which was essentially over by the end of the 1850s, having peaked in 1852. Nevertheless, approximately $2 billion worth of gold was mined during that short time. 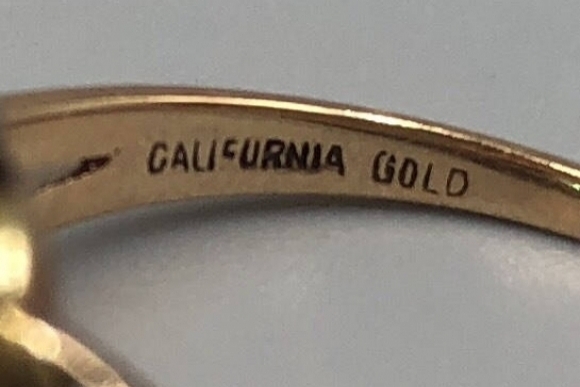 This ring marked California Gold was made from gold mined during the famous Gold Rush. 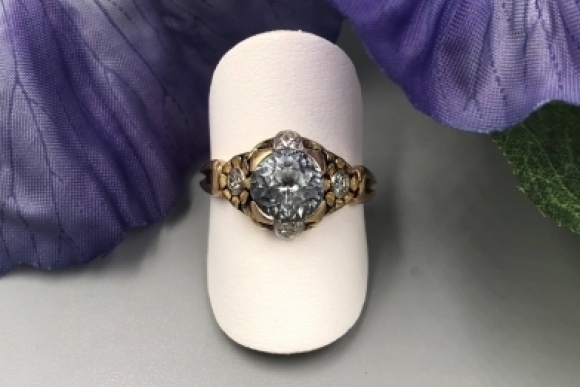 Montana sapphires were discovered accidentally by prospectors during the gold rush. They are found only in the Yogo Gulch in the Little Belt mountains of Montana. 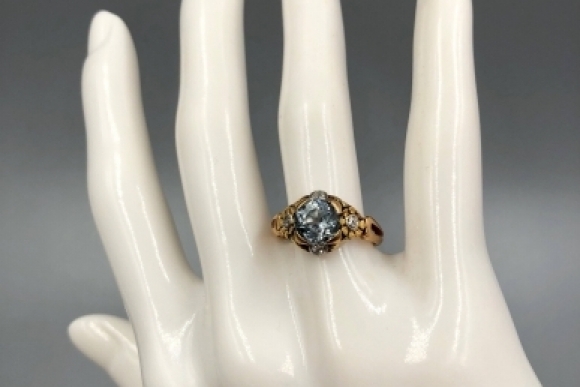 Known for their brilliant cornflower to light steely blue color, Montana sapphires are never heat treated as this will destroy their fine, unique color. These are the most precious sapphires found in North America. Perhaps the most famous piece of jewelry featuring Montana sapphires is the Tiffany & Co. 9" iris brooch designed by G. Paulding Farnham, chief Tiffany jewelry designer 1891-1908. The stunning corsage brooch is encrusted with Montana blue sapphires, and may be seen at the Walters Art Gallery in Baltimore. 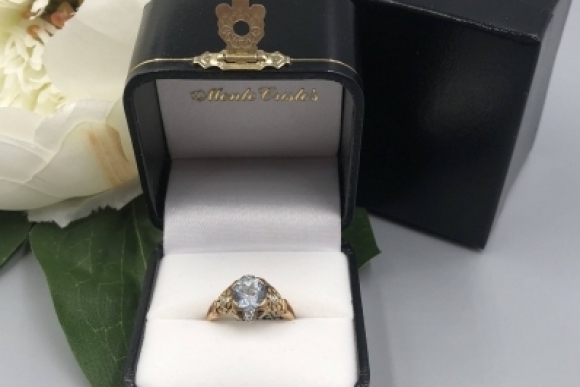 The ring is a size 7 1/4 and weighs 3.1 grams. Sizing for a perfect fit is complimentary. Good condition. The sapphire has facet junction abrasion especially around the table facet,as is typical of antique colored gemstones.